As the first full week of the summer holidays start for most on Monday 27th July, FC United of Manchester will open their doors for summer breakfast clubs. 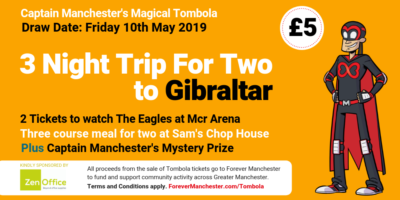 The breakfast clubs combine Forever Manchester’s Community Building work in Moston and Harpurhey as part of the Fourteen programme with the Kellogg’s School Breakfast Club model. The aim of the partnership is to help raise awareness of the importance of breakfast for everyone. This includes those who live alone, young people, families and older residents in the area of Moston, and will provide all with a nutritious breakfast. Funding from Kellogg’s will fund the breakfast club at FC United’s Broadhurst Park for 10 weeks of the school holidays starting this summer and continuing on into the next academic year. 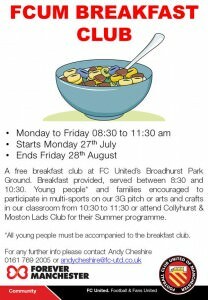 Andy Cheshire, Community and Education Manager at FC United said: “FC United is very pleased to be able to host the breakfast club at our brand new community football ground, Broadhurst Park in Moston. The breakfast club will run for the next 5 weeks of the summer holidays, a week in October, and a further three weeks across the Christmas and Easter holidays every Monday-Friday. “The aim of the breakfast club is to encourage families to attend Broadhurst Park, receive a free breakfast and engage in multi-sports activities on our 3G pitch as well as arts & crafts in our classroom. Collyhurst and Moston Lads Club will have coaches available at our ground to walk any interested parties to their venue for their Summer Boxing School. FC United’s club will run from 8.30am – 11.30am Monday 27th July-Friday 28th August. Please note: All young people must be accompanied by an adult to the breakfast clubs. If you would like to get involved, contact details are available on the below poster (click on the image to enlarge) or you can turn up to the ground at the available times. Volunteering opportunities are also available at the club. If you’re interested in helping out please email andycheshire@fc-united.co.uk.